Some years ago, we were happy to attend the wedding of our long-time friends the Tuancha-aim family in Nakon Sawan Thailand. 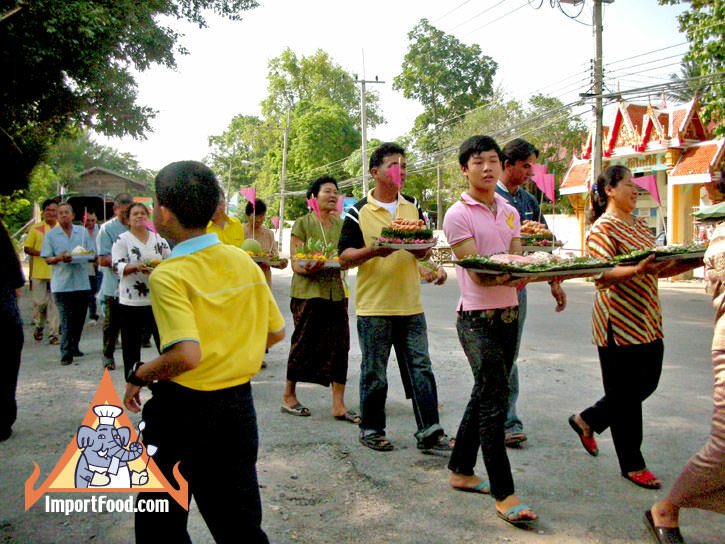 This was a traditional wedding following age-old customs and, in typical Thai fashion, a great deal of focus was on particular food served to mark the occasion. The dishes you see in pictures below were made by local shops and sold to the groom's family, then presented as a gift to the bride's family. In Thai custom the bride's family won't accept a groom unless he brings these special foods--money and jewelry is important too but the right food is just as important! 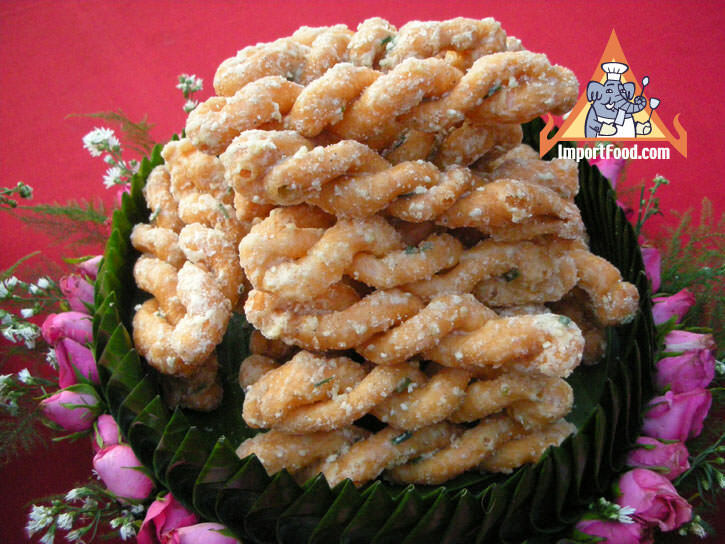 Although a typical Thai wedding includes these special treats, they are also sold in shops daily to anyone who might want to buy some. Notice the intricate folded banana leaves that create serving trays for each recipe, these were made by hand by member's of the groom's family. Click each picture to enlarge. 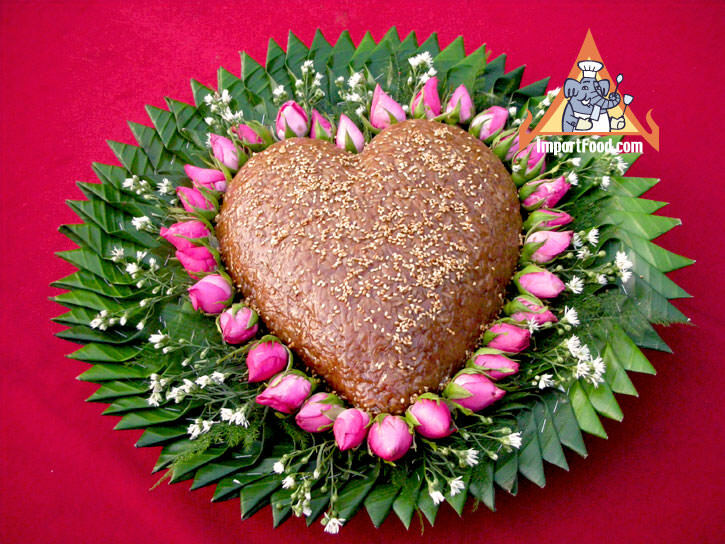 Khanom Kareaw is a sweet bread that's woven together, and when served at a wedding it symbolizes a blessing that bride and groom will become joined together forever. Khanom Tuay Foo is a very light, fluffy dessert. 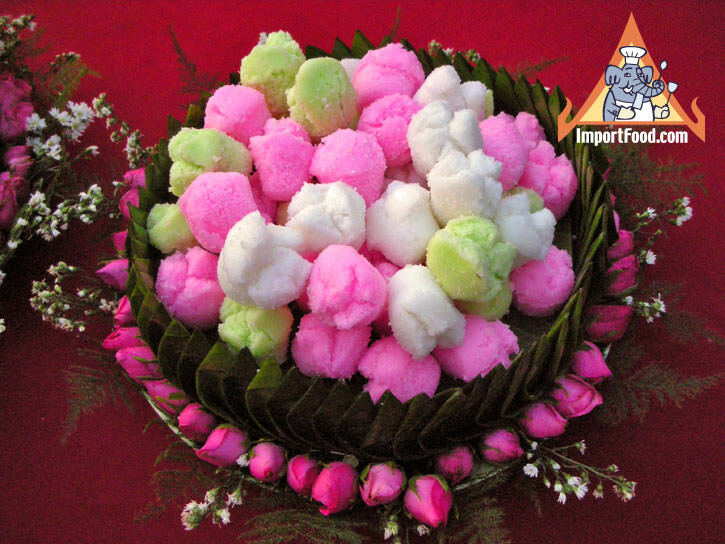 Made from rice flour, sugar, baking powder, food coloring, and scented with jasmine essence. It symbolizes growing strength of love, starting from a young love and maturing into the strongest relationship. Met Khanoon is made from peeled split mung bean, eggs, coconut cream and sugar in a brass wok. The taste is very sweet. Met Khanoon means "seed of jackfruit" which is what it resembles. At a wedding, Met Khanoon symbolizes that whatever bride and groom do in life, they will have the support of others, and never lose sight of their dreams. 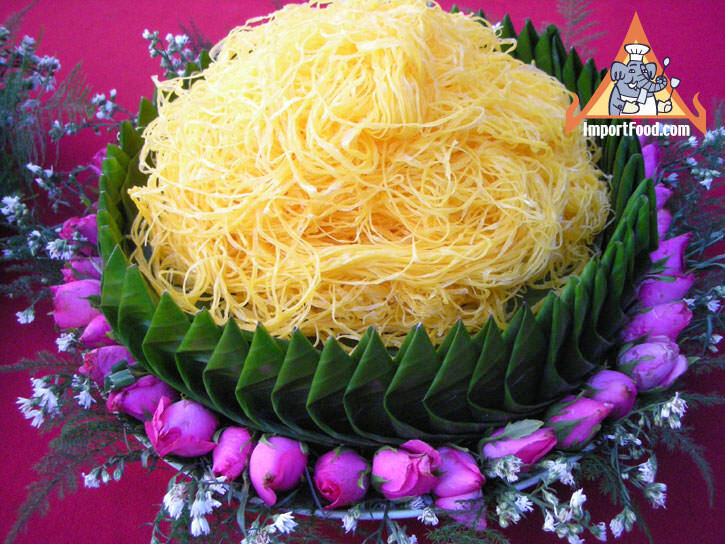 Foy Thong, also known as "golden silk threads" takes a lot of practice to make using a brass wok and a fine point cone (see: making foy thong), and every Thai wedding must have foy thong. Made of egg yolks and sugar syrup. The threads are long, and they symbolize everlasting love between the bride and groom--long like the foy thong. When it's made for a wedding party, the person preparing it should try to get the longest possible strands. Khao neeo dang means "red sticky rice". It is simply Thai sticky rice that's soaked water with alum powder for 5 hours, rinsed, then steamed, then stirred up with hot sugar caramel & coconut milk. The shiny mixture is poured onto a tray, flattened out, cooled then shaped into a heart and sprinkled with sesame seeds on top. As it takes a lot of time and work to prepare this dish, and it typically takes several people to make a large batch, this is served at a wedding to symbolize "Unity" between bride and groom. 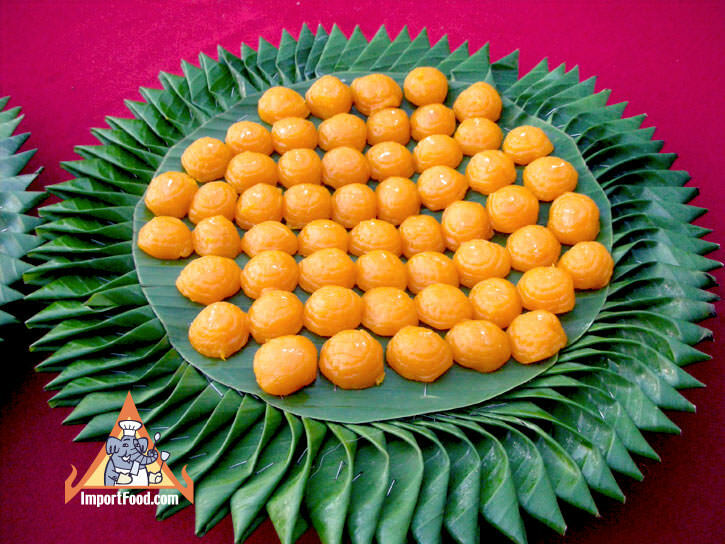 Thong Yod means "Golden Tear Drop" and it's difficult to make because it's hard to get a perfect teardrop shape, and this is always served in a traditional Thai wedding. Known in Thailand for hundreds of years, and the history of Thong Yod dates back to when Dutch explorers who arrived in ancient Siam and taught local people how to make dessert from egg yolk. 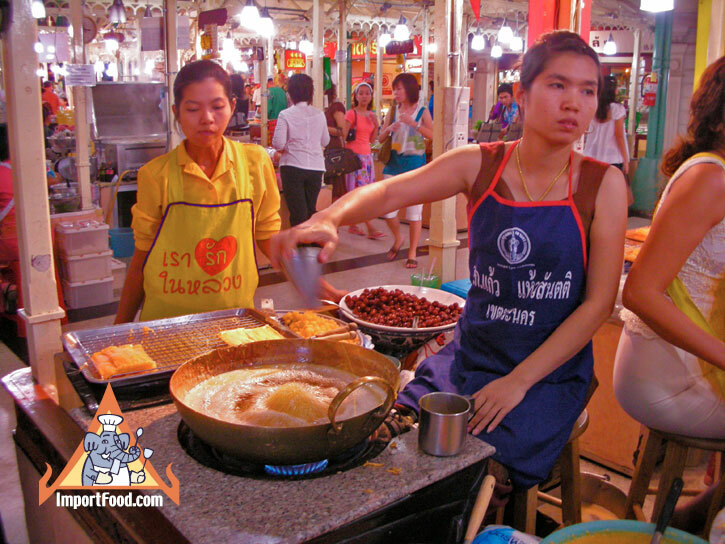 When visiting Thailand be sure to try Thong Yod, it's popular among all levels of society and served throughout the country. 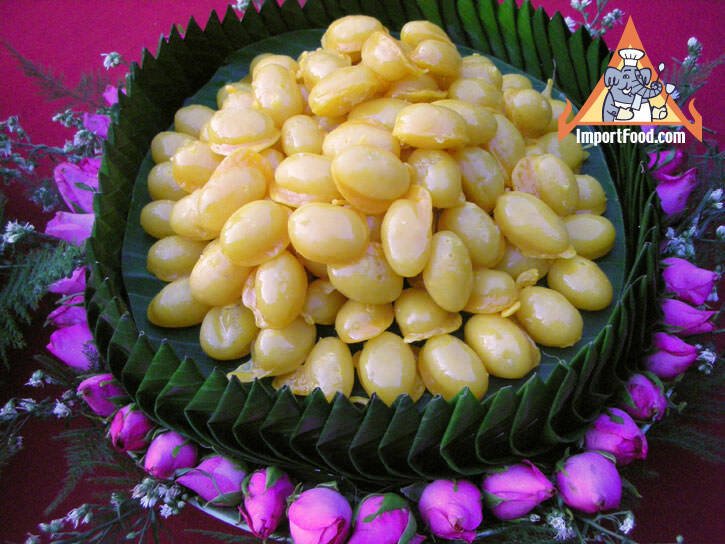 Thong Yod is made from egg yolk, sugar, rice flour, and jasmine essence. This dish symbolizes sweetness in love between bride and groom, and the gold color symbolizes good fortune in married life. 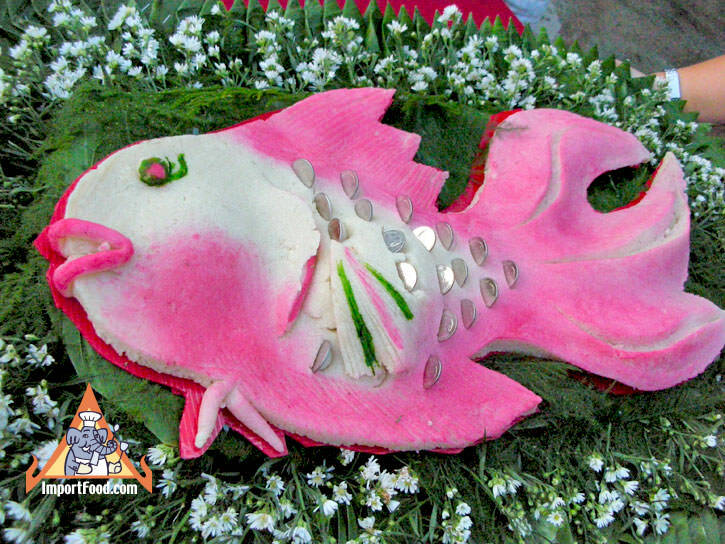 Pla Ngun means "Money Fish" and it's a Chinese-style cake made in the shape of a fish, with silver money as scales. This symbolizes money and luck swimming to the bride and groom. Khanom Chan is made from rice flour, tapioca flour, coconut milk, sugar, water, and various natural ingredients (such as carrot and taro) to get the different colors. 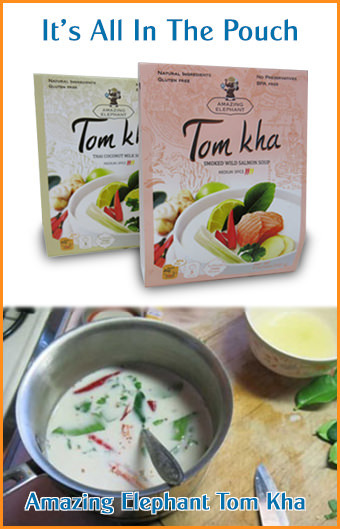 See: our Khanom Chan recipe & video. 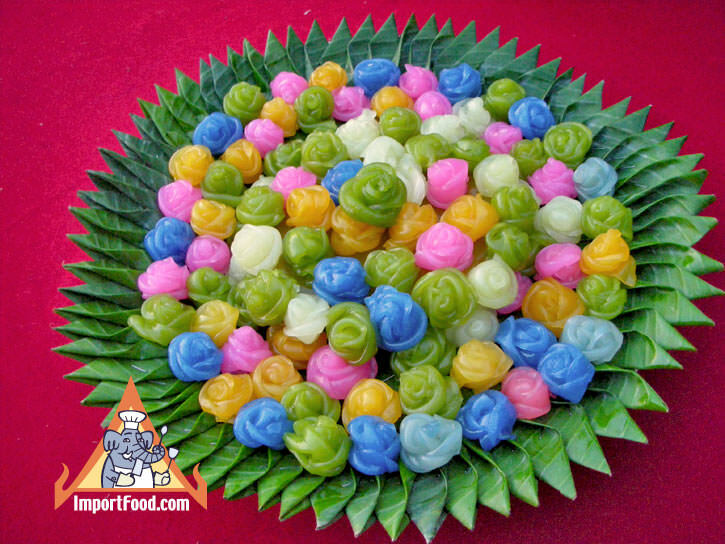 Here, each piece is shaped into a rose but khanom chan can be shaped into squares or any shape. This symbolizes the bride and groom moving forward in life and building family. Khan Mahk is always included in the parade of people from groom's family to the bride's family on the day of the wedding. 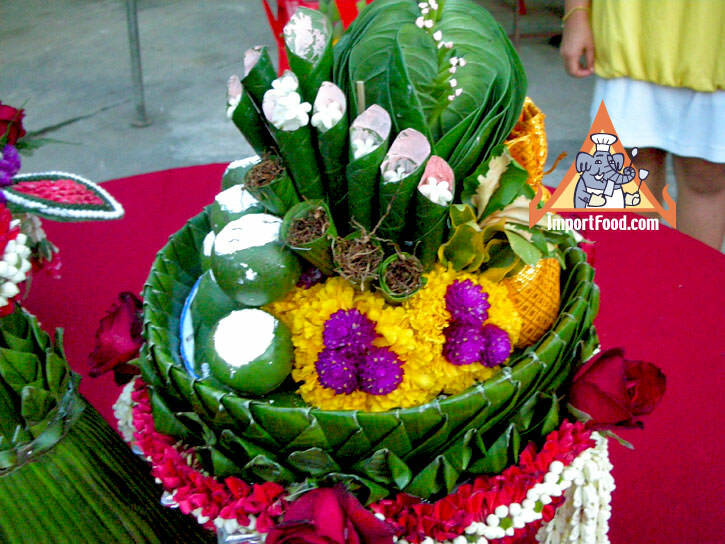 Khan Mahk is a special tray prepared as a gift to the mother and father of the bride, and the tray has assorted betel nut chew ingredients such as whole betel nut, tobacco, betel leaves, lime paste, along with flowers. See our story on betel nut chew in Thailand. There are also small silk woven bags of sesame seeds, mung bean, unpolished rice, and popped rice--all of which are sprinkled on money when bride and groom meet for the first time on their wedding day (see below). 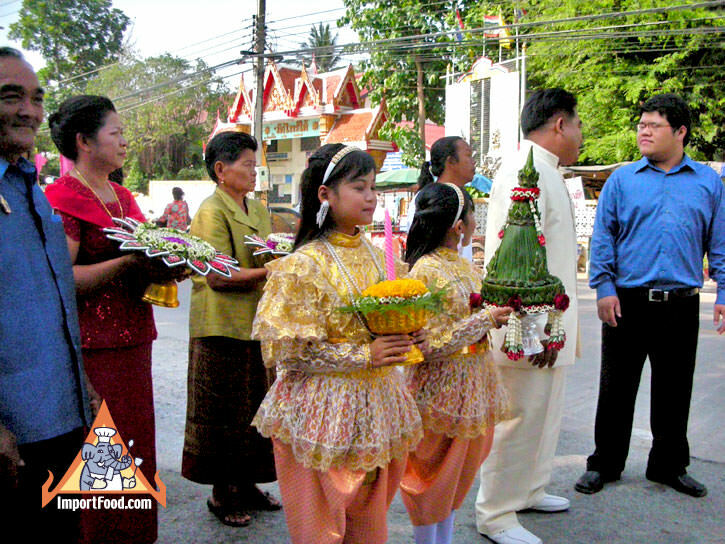 On the morning of the wedding (many Thais will time it so that the groom will walk in at 9:09 AM, a lucky time) a parade of people from the groom's side, including the groom, will form about 1/2 mile from the bride's house. At the front of the parade are two people holding sugar cane plants which will later be planted nearby. Carrying the Khan Mahk and special candle tray are young girls in traditional costumes (see photo above, center), and the food is adorned with flags to symbolize a special occasion. 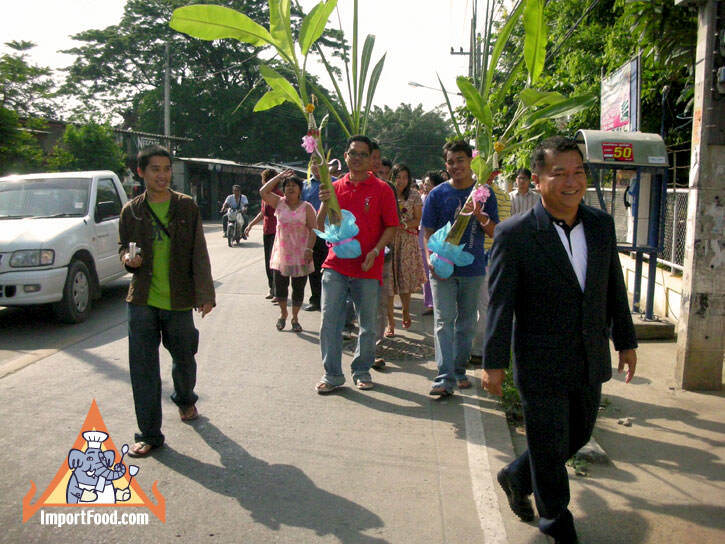 As the parade moves to the bride's house with each person holding a dish of food, the parade calls to announce arrival of the groom's party. A loud song blares from the bride's house which is a way to broadcast to all of the neighbors that on this day, a man will come to marry their daugther in the proper tradition. 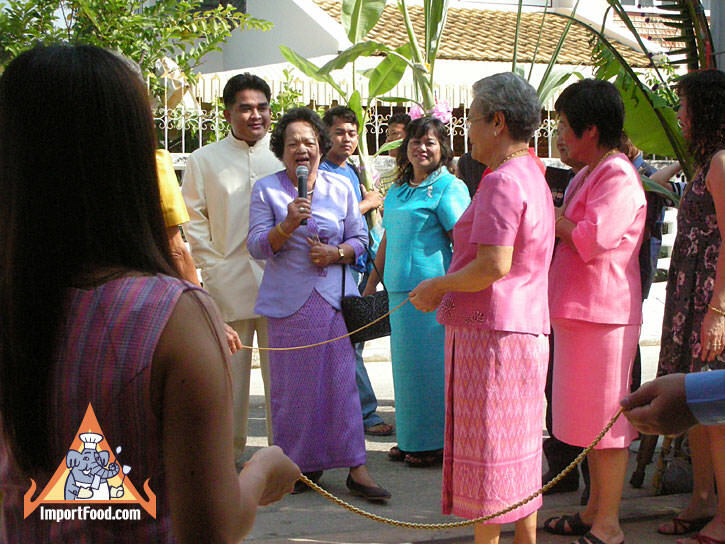 When the groom arrives along with his parade, an elder from the parade (seen above holding a microphone) announces that she is there to represent the groom's side. A playful exchange occurs at this point, as the bride's family stops the parade with solid gold chains. As tradition says, the more gold chains (called "golden door") at the bride's door, the more the groom has to pay to get inside. The groom's representative then playfully negotiates with the holder of the chains, suggesting that only a small amount of money is necessary to get inside. The negotiator might announce that the price is too high then turn the parade back as if to balk at the price. When a settlement is finally reached, symbolic money is given to the person holding the chain, the chains are lifted and the groom is led inside by his elder representative. Food is set down on a table, and the parade waits outside while bride and groom meet inside her house. Inside the bride's house, the khan mahk is opened to make sure nothing is missing. The groom brings a stack of money, called "sin sod" along with some gold and jewelry "tong mun". This is all counted by the bride's representative, as a form of tradition. It's done in front of important guests. Parents from each side then sprinkle the seeds over the money while saying a blessing for the couple, this symbolizes that the money between bride and groom should grow and grow. It is now lunchtime so everyone is treated to a meal provided by the bride's family. The sweets are usually kept by the bride's family to eat and share among people they know. During lunch, the groom's side will usually dare him to do something such as give his wife a kiss on the cheek, or lift his wife up to get money held from a window or ledge. Loud cheers might embarass the couple as they struggle with the various tricks and innocent dares presented to them, as tradition says the success of their marriage is related to how well they can play this game. After lunch at the bride's house, guests typically go home, rest, put on nice formal clothes and continue the wedding party that evening at a hotel or large restaurant. Also See: Thai Ordination Ceremony, and Eating a Thai Meal. 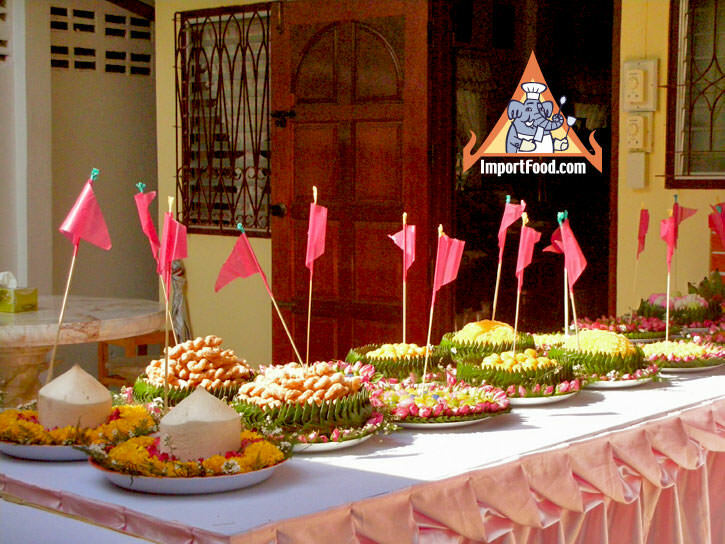 We hope you enjoy this report of the traditional Thai wedding and Thai food culture! Use the link below to send it to yourself or a friend. Also see our video feature of the Thai Ordination Ceremony.